News now in from Gregg Morton at Northrop & Johnson of a further $850,000 reduction on the 42.67m motor yacht Lestralaur, now an estate sale. Lestralaur was built in 1981 and originally launched as James Sinclair for the Canadian Fisheries Department to be used as a high-speed patrol boat capable of negotiating the rough waters of the Pacific Northwest. 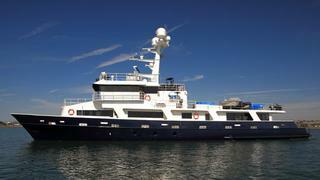 Renamed Lestralaur, she is 90 per cent of the way through a conversion into a luxury expedition yacht. She was lengthened and modified to accommodate a helicopter, re-powered with brand new MTU 12V 4000 main engines, and fitted with new stabilisers, bow and stern thrusters, plus many other mechanical and electrical upgrades. She will cruise at 16 knots upon completion. With accommodation for 10 guests, Lestralaur is now asking $4,900,000, down from $5,750,000.